The vernal equinox is a time of celestial occurrences; and this colorful bouquet is sure to create a heavenly reaction in anyone who receives it! With its bright blend of lilies, tulips, roses and more -- in divine shades of sunny yellow and dusky lavender -- its a blissful choice for any springtime occasion. 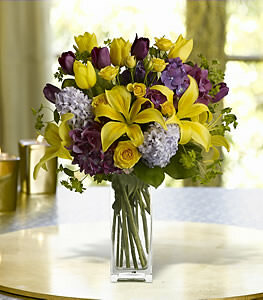 Asiatic lilies, spray roses, tulips, hyacinth and hydrangea -- in shades of yellow, lavender and purple -- is delivered in a clear glass bunch vase.